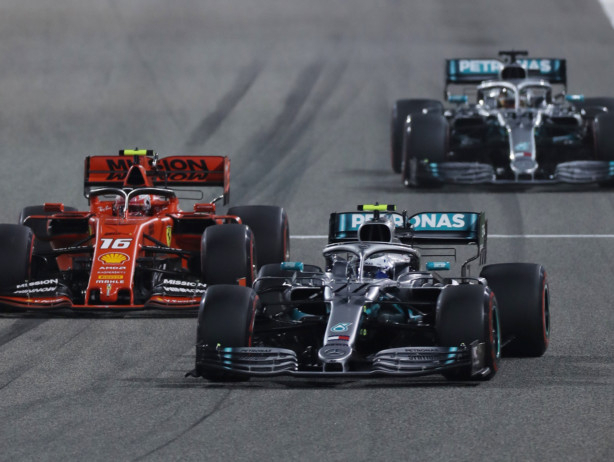 Sakhir: Mercedes driver Lewis Hamilton capitalised on a series of mishaps for Ferrari to claim victory in the Bahrain Grand Prix. The defending Drivers’ Champion had been slower than the red cars of Sebastian Vettel and Charles Leclerc all weekend in Sakhir and duly began the race in third spot behind the pole-sitter from Monaco and his German teammate. Youngster Leclerc did not make the best of starts and Vettel and Mercedes’ Valtteri Bottas — the championship leader following his victory in Australia last time out — overtook him. However, Leclerc soon found his groove and was back leading the pack following a frenzied first few laps. Things looked to be going Ferrari’s way as they stretched the gap over their Constructors’ Championship rivals and Mercedes desperately looked for answers to match the Italian marque’s superior speed. Those solutions presented themselves in the guise of two calamities — one human error and one technical tragedy. Following the mid-race pit stops, Hamilton was all over second-placed Vettel, and the German again showed his mental frailties by locking up and spinning on the track, dropping him down the field and effectively ending his chances of winning the race. The Leclerc’s chances of a first Formula One victory to go with a maiden pole position went up in smoke as his car lost power and had to limp through the remaining laps as Hamilton then Bottas powered past him. Leclerc held on to take third spot on the podium, but only thanks to a silver lining to his dreadful day as the two Renaults of Nico Hulkenberg and Daniel Ricciardo both failed on the penultimate lap, bringing out the safety car and preventing Red Bull’s Max Verstappen from chasing down the Ferrari and taking third spot. Leclerc, meanwhile, put a brave face on things and said: “It happens, a part of motorsport, unfortunately today it was not our day but I’m sure the team did an amazing job. We have been very lucky in a very unlucky situation as we then had the safety car situation. Hamilton summed up a crazy day by saying: “Today was a really, really hard job and the team were incredible. It was a devastating race for Charles.